When I first set out on this journey, I debated between buying a round the world airline ticket versus buying flights as I went along. I had the potential to save a lot of money by prebooking everything, but I knew that I would want flexibility along the way, so I went with the latter option. I'm especially glad now for having made that decision, as I'm sort of tossing out the original script for the next step in my journey. Originally, I had planned on attempting to fly directly from South America to South Africa. It made sense from a "moving from the west to the east" perspective, and I had always heard that Cape Town is pretty amazing in January. I had always planned on skipping out on Europe - I've already been to many European countries, it's an "easier" place to visit later in life (when I'm less willing to deal with hostel dorms and squat toilets), I would want slightly nicer clothes than my current backpacker set, and it's just flat out more expensive. Even with one of my closest friends studying in Scotland for the year, I simply figured that Europe wasn't a great option. While Cape Town is phenomenal in January, the rest of the southern part of Africa is brutally hot around that time as well. And given that I have an actual tour already booked for India in March, it didn't leave me a ton of time to really explore Africa the way I wanted to. I could alleviate my concerns about timing by visiting fewer places on a more relaxed timeframe. Also, my parents were now coming to visit me in Buenos Aires just after Christmas, so they could actually bring me a few bits of my winter wardrobe, which I could then ship back home before leaving Europe. I've never actually been to Scotland or Ireland, and with my friend's class schedule giving her much more free time than we had originally expected, I could easily stay for a while and potentially explore more of the area. While I've been to Portugal once before, it's been one of my favorite destinations, and it would give me an opportunity to spend time with a friend that I met briefly on my first visit, but who I've kept in close contact ever since. Portugal also happens to be situated very close to Morocco, a country I've been dying to visit for years, but didn't fit easily on my pre-existing round-the-world circuit plan. I started looking up flights, just on a whim at first, and I actually found a good one - relatively inexpensive, even. It was on Turkish Airways, which would mean a ridiculous connection / layover situation in Istanbul in between Buenos Aires and Lisbon. Except that meant I could actually extend my layover - make it a stopover, if you will - to an entire week. For an even lower price. A week in Istanbul, some time in Portugal and Scotland (and friends to visit), and a potential trip to Morocco. Suddenly this seemed like a pretty attractive option. So, I've decided to take advantage of my decision to not pre-book everything and have a bit of adventure in and around Europe (and northern Africa!). I'm pretty excited for the opportunity to not only see some completely different places and cultures than what I had originally planned, but also to see some familiar faces that I've dearly missed. Now don't get me wrong, I still want to visit southern Africa - Kenya and Tanzania and South Africa and many places in between. But perhaps they'll wait until later in the year… whether it's after India or after southeast Asia, or even if I need to make it a trip unto its own… I will definitely spend time there. This also means that my time in South America is coming to a close today. The last nearly four months have been absolutely incredible, and it seems surreal that I'll be leaving the food, the language, the wonderful people I've met along the gringo trail, the entire continent… in just a few hours. But, the journey must go on. And don't worry, there will be plenty more photos and stories about South America - Torres del Paine and the W, Ushuaia, Iguazu Falls, and a few weeks worth of time in and around Buenos Aires - still to come! 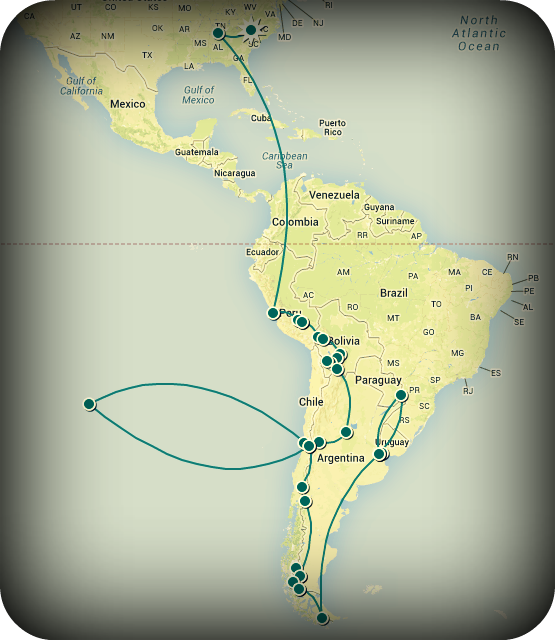 My route thus far, nearly four months through South America. Such adventures. I'm jealous. Definitely do Morocco. It's awesome. Thanks, Lori!! I'm planning a few nights in Marrakech - any other recommendations?? I second Morocco. And if you find yourself near Switzerland - let us know. You have a room at our place. Safe travels! That sounds like great plans and I wish you a lot of fun in Europe! I've been to Istanbul and Lisbon last year, you'll love it. And Scotland is beautiful. If you can, rent a car!